“Flower Words Background” was embossed in white on cocoa brown card stock, trimmed with deckle scissors and layered on yellow card stock. “Rose with Stem” was stamped on white card stock, colored with pencils, cut out and glued to the word background. 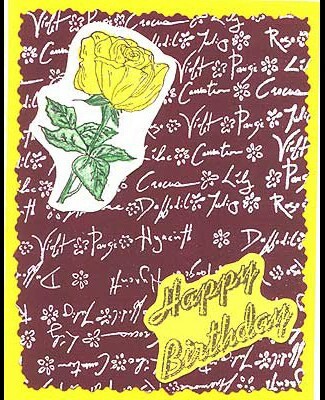 “Happy Birthday” was embossed in gold on yellow card stock, cut out and glued to the word background. Card by Davetta Alexander.